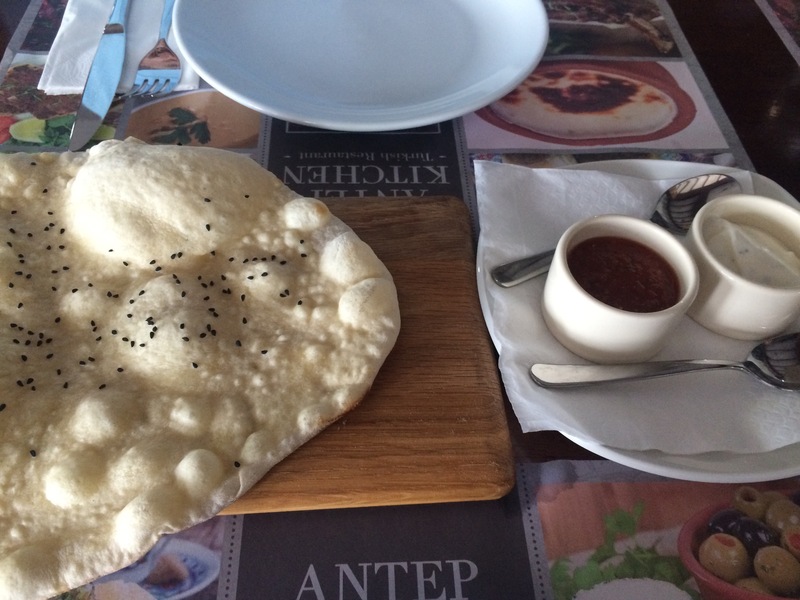 Home › Dining out & about › Antep kitchen -a kinda review really.. Well not really we had lunch.. And it’s new.. There you go..
We are very lucky really.. There is often a new place opening quite close.. Ok so some are just replicants or ‘new’ chains.. Yet sometimes there are some excellent chefs passing through with their ‘local to them’ knowledge.. And this is when I sit up for sure and the desire to learn more and taste their offerings kicks right in.. There have been a number of restaurants trying things out on this building.. I knowthechap that owns the building and he swore to me that these new chaps ( and yes they are all chaps!).. Had something special… Like real good food for starters! So after receiving the nod from another friend that he required a lunch ‘meating’.. Off to the Antep kitchen I head.. 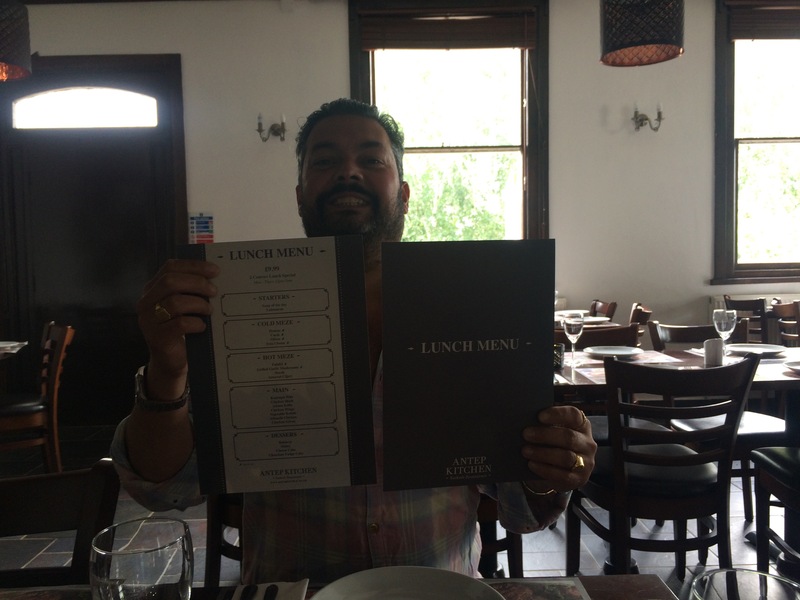 Here is me holding the menus.. It’s the lunch menu..
Now why a pic of me holding the menu? Well it was a wee bit confusing that menu.. You got two courses for a set fee for lunch.. A choice of starters , a main with sides.. And then dessert.. Hang on.. Let’s do that again..
Two courses. Choice of starter, choice of main, and dessert. Umm that’s three courses right? Anyhooo lets pop that past us.. I kinda wished that we could have just had a mixed mezze for the starters.. Yet nope we had to choose.. 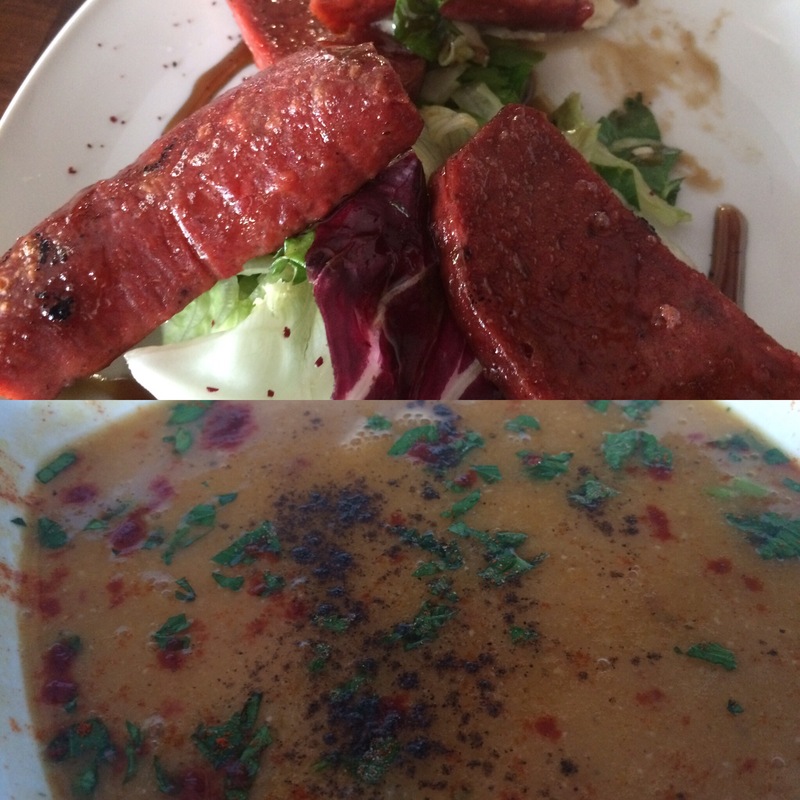 So being good pals and knowing that we could taste from each other’s plates we went for the soup ‘lachana’ and the sujuk.. (Turkish sausage and quite a fave of mine!).. Order in and out comes some fresh cooked bread with black sesame and dips of chilli and yoghurt..
What a wonderful bread! Check out those bubbles! The sausage was as expected.. Freakin delicious! And the soup?.. The soup?,, well indeedy doodle that soup was superb! I am not a big lentil fan.. Yet when done well .. And this really really was done well , it just makes your heart sigh.. Brilliant! Now to be honest we could have stopped there.. It was more than adequate for lunch.. Yet we still have two more courses to go! (Ummm yeah on that two course lunch menu..)..
Tavuk guvec A chicken dish that was crammed full of flavours and veggies too! In a sizzling plate rather than the earthen wear pot.. Fantastic flavourful rice came with it too.. That only issue with this dish? It was WAY too big! It got poked at a bit..then taken home in a carton..that’s my pals supper sorted! 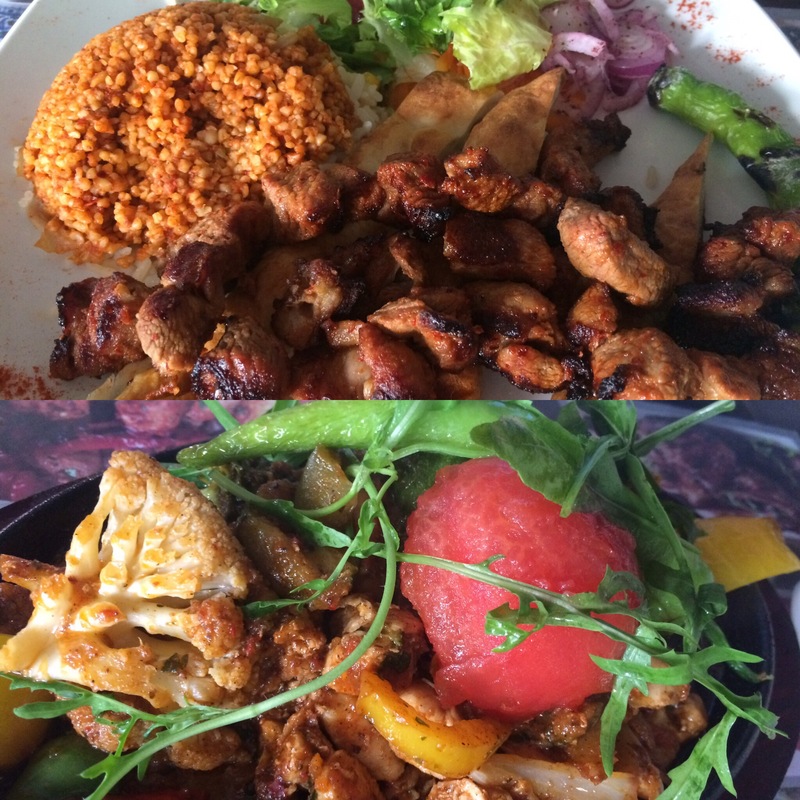 My adana kebab appeared on the table too..and man it was lipsmackingly tasty .. With a rice and a sort of large couscous.. Or maybe a bulgar wheat..don’t know for sure.. Yet there was not one issue with this dish.. Not one! The sweet , sour , savoury flavours.. The sumac, the pomegranate molasses sauce.. The whole nine yards !! Having travelled a little in Turkey.. And eaten some seriously good food.. I can rate this food as right up there..like seriously right up there.. Oh.. Oops! Ok here’s a pic..
See what I am trying to say? It’s fresh tasty and made well..
A good mutual thumbs up from me to chef.. A knowing look in his eye that he certainly can cook this type of food.. And a knowing nod that I appreciated his knowledge..
Will I be going back? Heck yes! Far too much for lunch though.. The baklava we had to take home with us alongside the ‘doggy’ bag! I hope these chaps stick around a while.. I also hope that they let you order just a couple of smaller dishes for lunch.. Maybe then they will be a little busier.. There were plenty people popping in to book tables though.. This was real eating .. Nice one Antep kitchen.. Nice one.. And for 9.99 each? Unbelievable..for two courses! 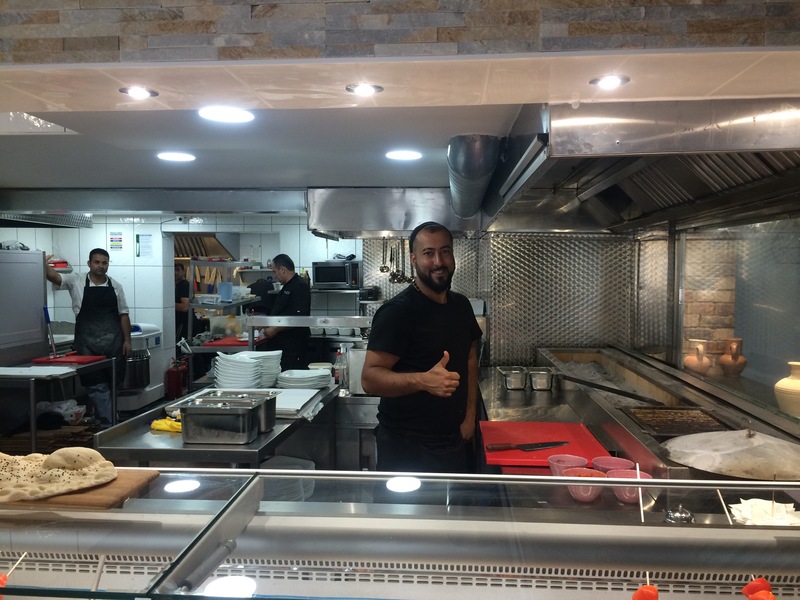 Tags: #mangal, #mkfood, @antepkitchen, @mkbloggers, where to eat in milton keynes?